Celebrated prison melodrama, 'The Shawshank Redemption', will begin a 5 month 'term' at London's Wyndham Theatre starting on September 13th and finishing on Feb 14th 2010. 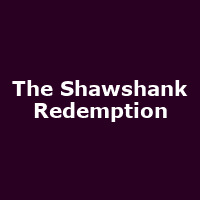 The play is based upon Stephen King's short novel, "Rita Hayworth & The Shawshank Redemption" which draws reference from a scene in the story whereby a poster of the afore-mentioned screen-starlet is accepted in exchange for contraband. This exciting version features 2 stars of stage and screen - Kevin Andersen (Sleeping With the Enemy) plays Andy, the hopeful banker convicted of his wife and lover's murder (and serving 2 life sentences for his alleged pains) and Reg E. Cathey (The Wire) plays 'Red', the prison-mate who befriends him in the dreaded Shawshank prison, a fictional pen near the coast of Maine. The plot centres around their friendship and courage against the odds whilst giving the central financial character a chance to advise prison inmates and staff alike on tax and credits etc. When the film starring Tim Robbins and Morgan Freeman was released in 1994, it drew modest box-office takings but, through ecstatic reviews, became a cult hit before becoming one of the biggest DVD sellers of all time. It's a great story and pretty hard-hitting at times - the production is only for over 15s I'm afraid. The show previews from 4th to 12th September when the ticket prices are reduced to £25 and £35 for the Grand Circle and Stalls seats respectively (reduced from the usual £37.50 and £49.50). Balcony seats are also available for all shows, costing just £15. Nearest tube is Leicester Square.